A Thing-A-Day – (Almost) All of February 2011! Thing-a-day.com is an initiative that motivates crafts people to spend 30 minutes a day – all those 28 days of February – creating something. And that something can take any form. I am on it. And i try to tie my products to all my recent mind-perception-time-space-reality interests, while also fighting my way back to hands-on dirty electronics, knives and epoxy actions. Little square magnets fit perfectly into the narrow channels of the corrugated plastic board. Once inside they react to their neighbors – attracting and repelling each other. The little board can be shaken or further meddled with using external metals or magnets. 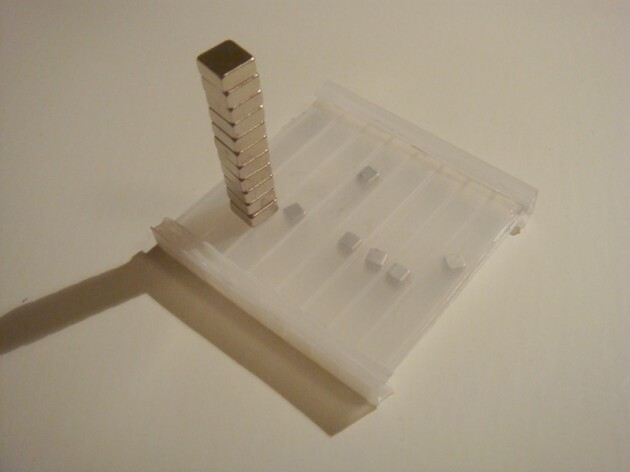 The arrangement of the magnets makes it look like a 8-channel sequencer with potential for further development. And it’s an addictive toy to play with, as is everything magnetic! This is an idea, that demands more than 30minutes to be executed. The object “Know Thy Millisecond” will be a time-toy, a time-puzzle that lights up only if you press its two buttons at a very exact time interval. The current execution would need 4 555-timer circuits, an AND gate and an inverter. Too many components for the imagined size of the object! 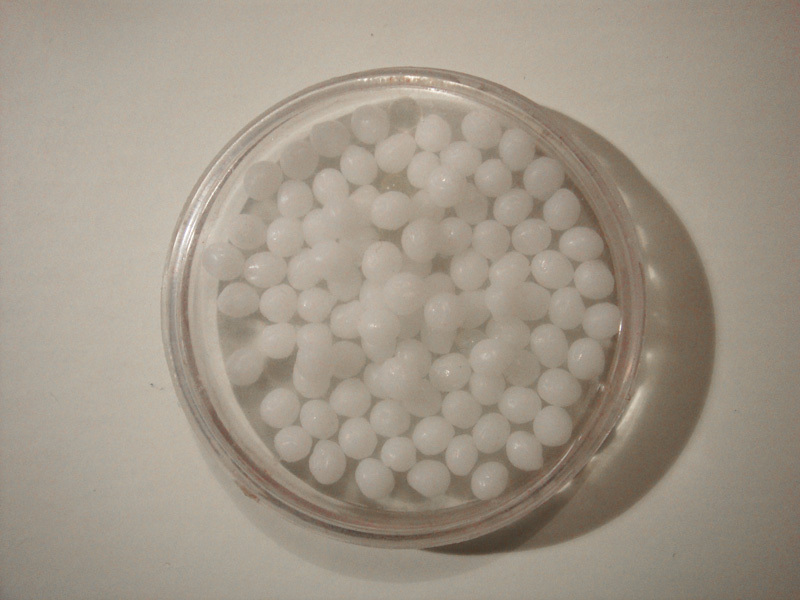 A little plastic case containing 100 tiny beads – 96 of them are white, 4 of them are transparent. It’s a “Uni-n-verse” – an inversion of our universe. The 4% of matter representing the observable universe are transparent while the 23% of dark matter and 73% of dark energy – that are beyond what we are able to perceive – become visible. 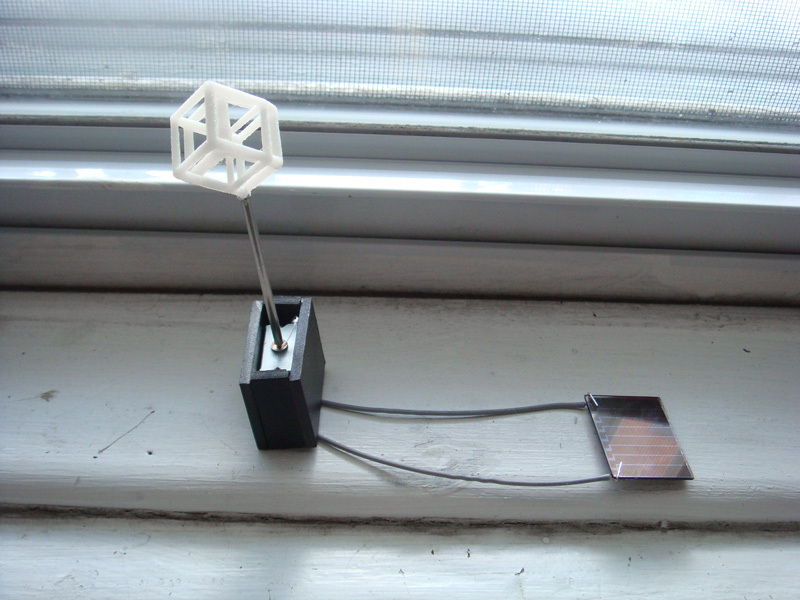 A small DC-motor, a solar cell and a 3d printed little wire-frame model of a hypercube while being rotated through 2 dimensions (one of them being dimension number 4). I’ve had these 3d-models from a former experiment and always wanted to put them to further use. The motor is directly powered by the solar cell, and the soldering of the solar cell was nearly impossible. Right now the whole constructions leans on my windows sill to test if any movement will happen at all, or if all the soldering caused some damage. I am trying to recreate the Shepard tone phenomenon with PD. The goal is to create the illusion of a tone with a constantly rising pitch. The results are not satisfying yet, i’ll have to tweak and refine it a bit more. 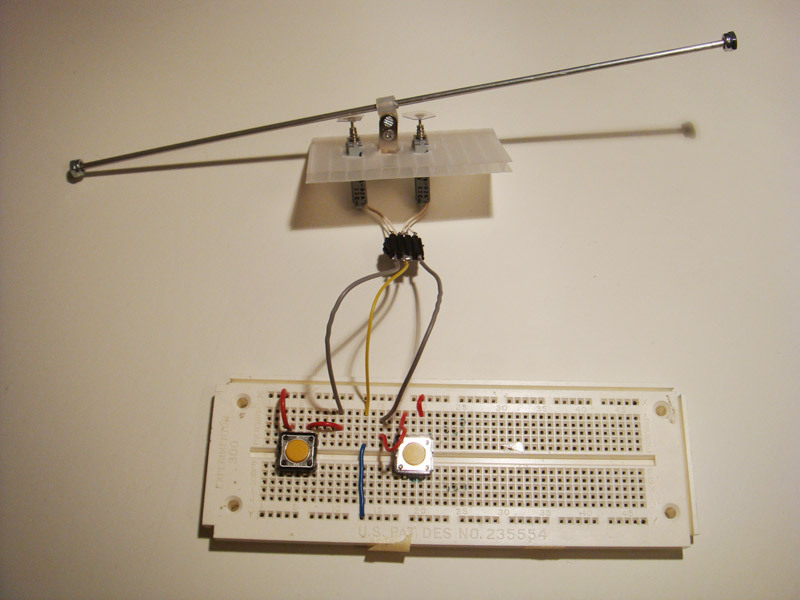 This is a simple light chaser circuit. 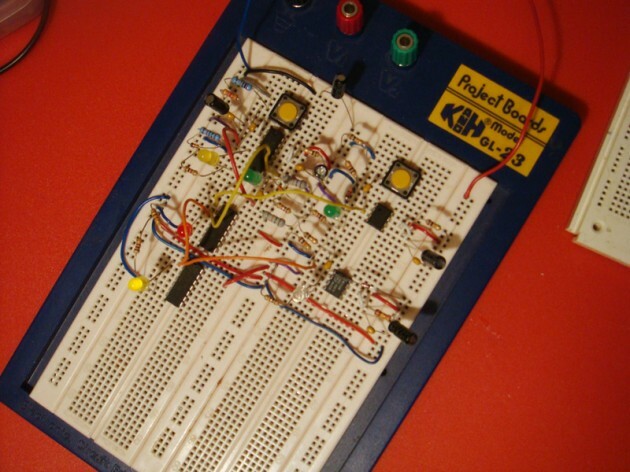 A 555-timer pulses at regular intervals and a decade counter activates the 10 LEDs at the LED array one after the other. 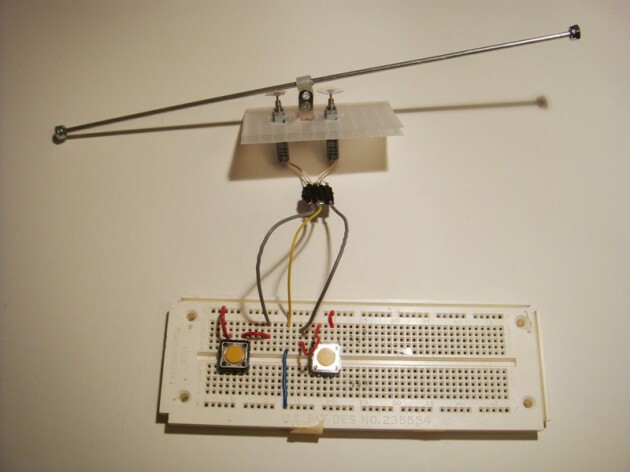 Two 100k potentiometers allow to switch frequencies between ~1 and 100. The clock can be tuned so that one pulse represents a second, or that the whole LED array is flashed 10 times per second. Next step: soldering onto PCB. Part 2! Such a good feeling if a freshly soldered circuit behaves exactly how it should, without any need for debugging! 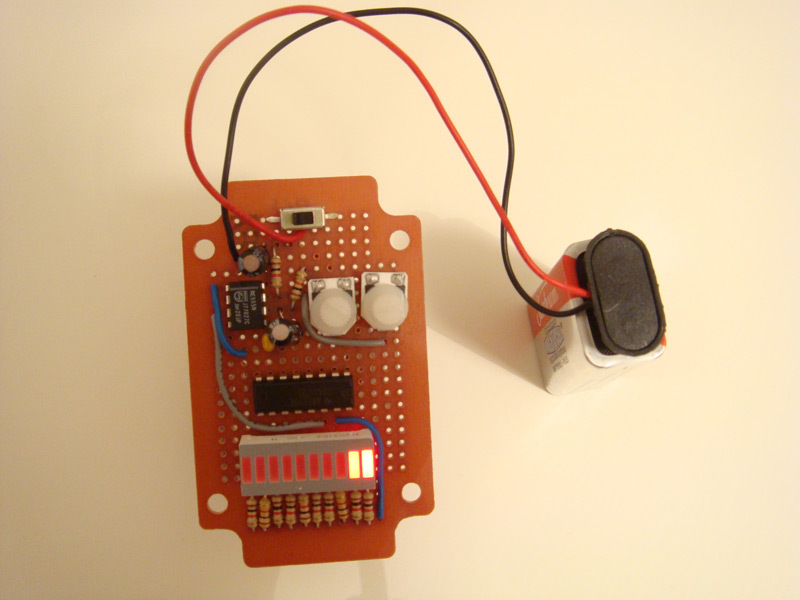 The 555-timer LED chaser clock runs on a 9V battery (calculated lifetime of about 15 hours … let’s see). You can use it as a visual metronome and fine-tune the frequency to match your favorite beat! 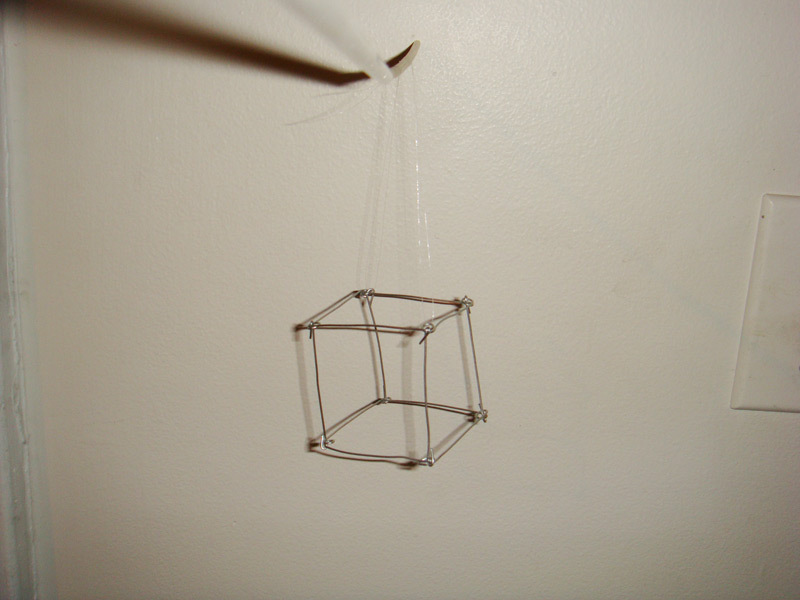 This very-imperfect wire cube is for testing the optical Necker-cube illusion on a 3D model. Blurry eye vision and not-exact geometries help with achieving the effect, that let’s you flip between two geometric realities in your head. 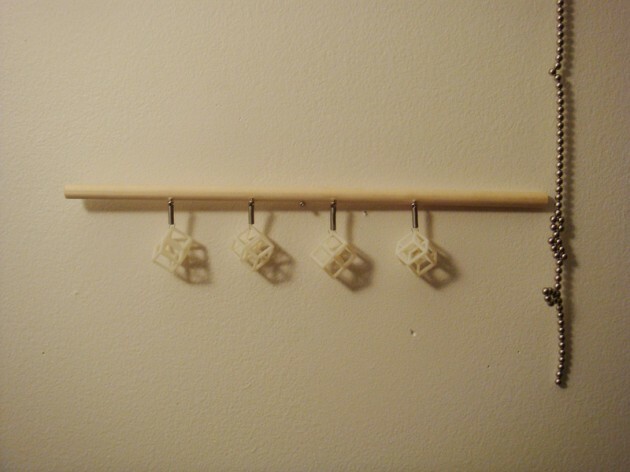 Lining up four 3d-printed hypercubes, each one ready to bounce on its spring. 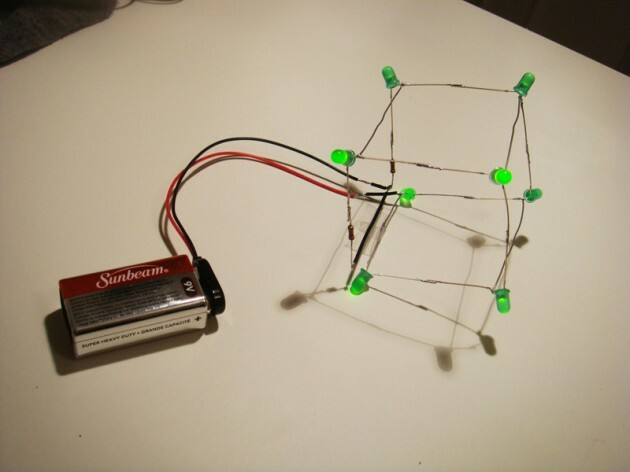 8 LEDs, 2 resistors and a 9V battery – another cube, this one with green corners. Two rotating Necker Cubes! It is easy to have them rotate in the same direction, so try flipping one of them around, so they rotate against each other. Also, another observation: If you focus on having them rotate in different directions, one blink usually destroys that. You blink and when you gain back your vision the cubes rotate in the same direction. Because having them share the same perspective is the easier choice. Part (2) of the endeavor to create a time-sensitive toy that only lights an LED when you hit 2 buttons at a very specific time interval! 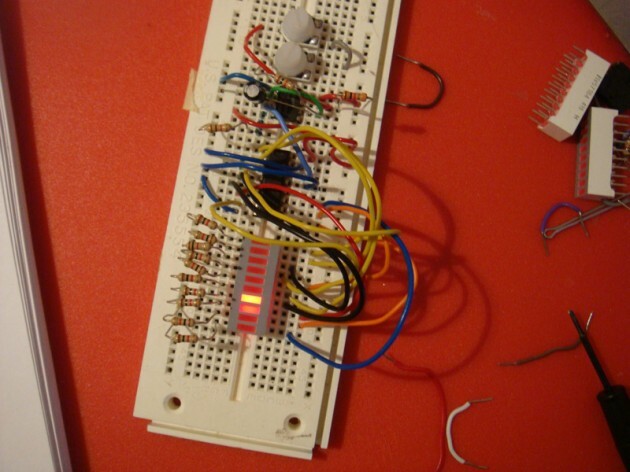 I’ve tested the circuit on the breadboard, that’s what you see here. The circuit includes four 555 timers, one AND gate, one inverter (for the future: AND + inverter = NAND, less parts! ), 2 buttons, several debug-LEDs and an army of resistors, capacitors and diodes to create the 555 dynamics incl. trigger networks. 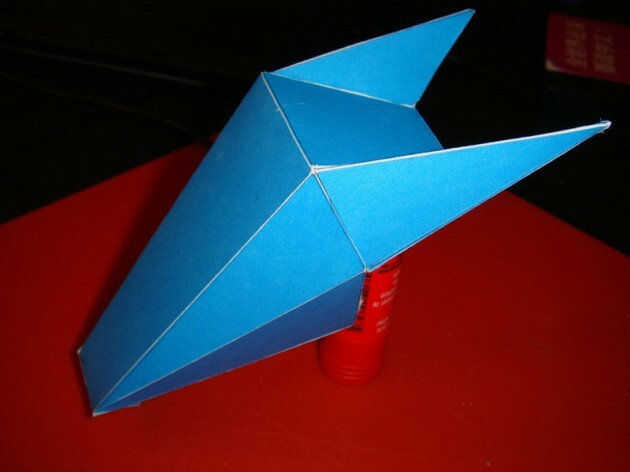 Bringing the head of a 3d-model to life, by simple cut-out and folding of the polygon-skin. 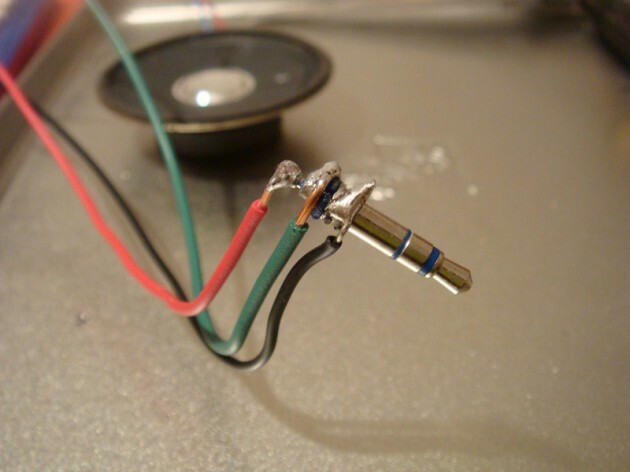 Today i cut-apart and re-soldered an audiojack, that also helped to produce some messy and unrepresentable noise. 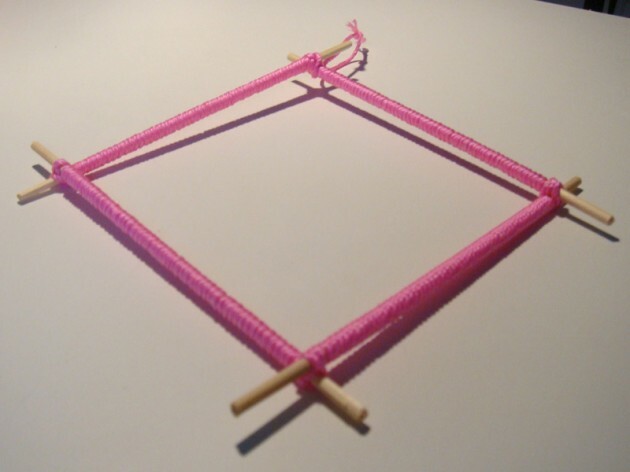 A sorta-frame made from skewers wrapped with a pink string. I am slipping. 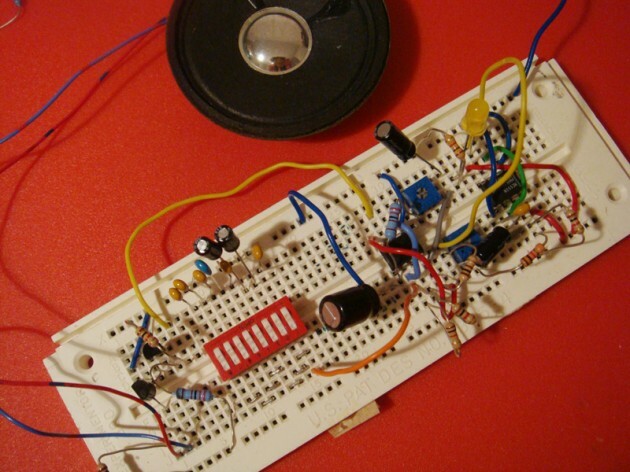 This time the audio amplification circuit was working without noise. 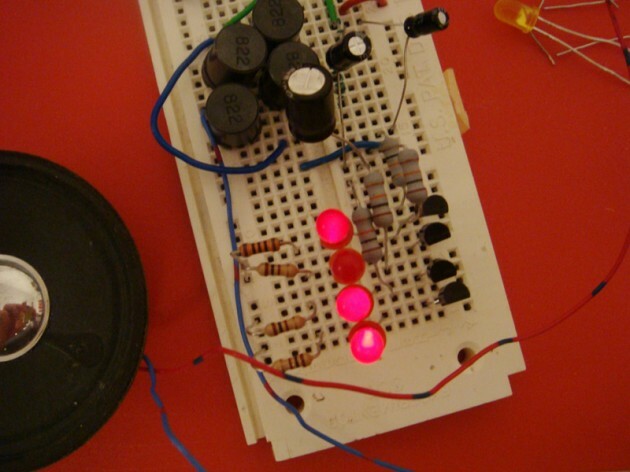 Here i am experimenting with putting different high-pass and low-pass filters on the signal, trying to produce a light-organ that channels different frequencies to different LEDs. Posted in Projects and tagged dark energy, dark matter, magnets, thing-a-day, toy, universe.